Robin M. Jensen is The Patrick O’Brien Professor of Theology at the University of Notre Dame. Her numerous books, articles, and essays in collected works reflect interests in the interlacing fields of theology and the arts. Her most recent book, The Cross: History, Art, and Controversy (Harvard University Press, 2017) examines the symbol’s doctrinal questions, particularly about whether the crucifix should emphasize Jesus’ suffering or his glorification. 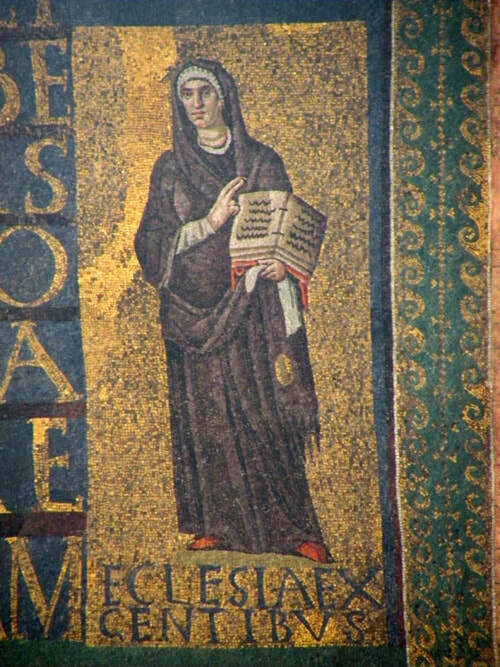 Sometime in the mid 430s, Pope Sixtus III commissioned a Roman workshop to create a program of polychrome mosaics for the church of Santa Maria Maggiore. Today, these are some of the oldest surviving Christian mosaics anywhere—albeit much restored at various times over the past millennium and a half. Along the upper nave walls, a series of individual panels depict scenes from lives of the Old Testament patriarchs (Abraham, Isaac, Jacob, Moses, and Joshua). The triumphal arch contains a mosaic program that displays episodes from the infancy of Christ, from the annunciation to the massacre of the innocents (Fig. 1). At the lower left and right springing of this arch are representations of the cities of Jerusalem and Bethlehem (Fig. 2). Above the gem-studded city walls rise the roofs of buildings that they enclose. Open central gates reveal colonnaded passages and suspended golden crosses. A group of lambs gather at these gates, as if preparing to enter. These cities are named, so as to avoid any possible confusion, and their significance in this and similar mosaics is the subject of this short article. Older examples of this “two cities” motif appear on a grave relief, an ivory casket, and in Roman gold glass. One gold glass, now in the Vatican Library (Fig. 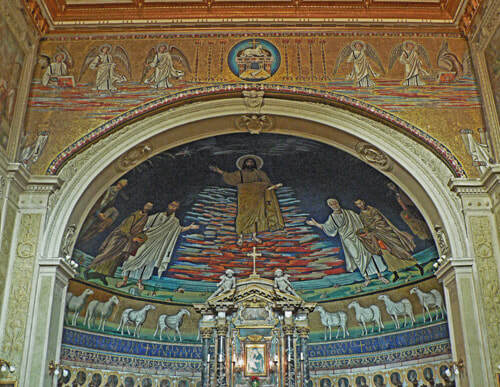 3), shows the lambs in procession immediately below a depiction of Christ handing the law to Saints Peter and Paul. Although the object’s fragmentary state makes it difficult to see, the scroll that Jesus hands to Peter bears the final letters of the word “DOMINUS.” Based on similar examples, this probably abbreviates the legend dominus legem dat (“the Lord gives the law”). In this instance, instead of two groups of six lambs congregating in front of the gates, processions of three lambs appear to be leaving each city (JERUSALE and BECLE) and moving toward the Divine Lamb who perches on the promontory of a heavenly Mount Zion or Eden from which four rivers flow (cf. Rev. 14:1-5 and Gen 2:10). The word “JOR-DANES” that appears above and to left of the Lamb indicates the Jordan River. Art historians have speculated that the scene’s original version adorned the apse of St. Peter’s basilica when it was built sometime in the 340s or 350s. Perhaps the first monumental Christian apse mosaic, its imagery undoubtedly influenced other works of art, from tombs to small devotional objects. Sometimes the iconography omitted the image of Christ giving the law or the lamb upon the rock and simply adopted the two cities motif. This subject is found on arch mosaics from the fourth through the twelfth century and was particularly popular in Rome, where it occurs in at least eleven major churches (Fig. 4).1 Each of these examples is unique, but all of them include the two cities. Although the cities are not always named, where they are, Jerusalem is always on the left and Bethlehem is always on the right. Most, but not all, include lambs processing from the city gates. 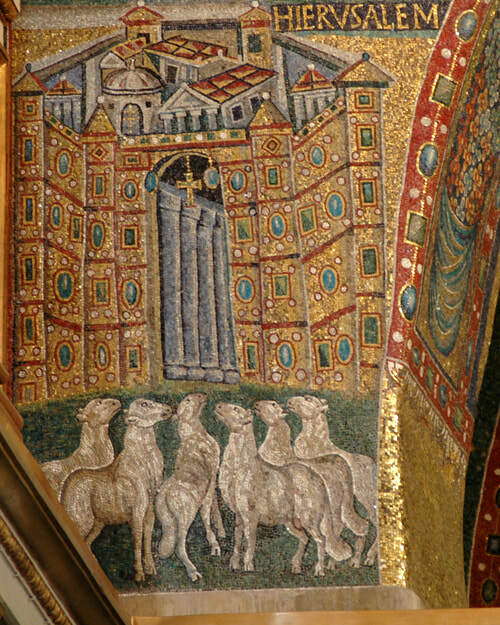 Excepting the examples in Ravenna, all of their compositions include either the traditio legis motif or an image of the Divine Lamb standing upon the rock of Zion/New Eden or both. The Jordan River appears in three instances, palm trees with a perching phoenix in three, and the four living creatures in eight examples. Scholars have offered a variety of interpretations of this “two cities” motif, most of them proposing several possibilities and so avoiding a definitive conclusion.2 Noting the jeweled walls, it is natural to presume that the subject is modeled after the description of the New Jerusalem of Revelation 21. However, Revelation never refers to a “New Bethlehem,” which complicates that identification from the outset. 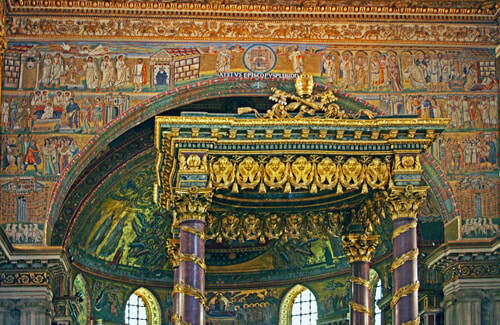 In addition, the walls are not always jeweled (as at Cosmas and Damian). Other readings are possible and perhaps even more compelling. One may view two cities as referring to events in Jesus’ life, with Bethlehem representing Christ’s incarnation and nativity, while Jerusalem refers to his Passion, or the beginning and end of Christ’s life on earth.3 However, this explanation is challenged by the left-right placement of the cities, assuming one reads images in that direction.4 It also does not account for the jeweled walls or the lambs. It does, however, make some sense of the Jordan River (when it is included), insofar as it might refer to Christ’s baptism, falling of course, chronologically between his birth and death. 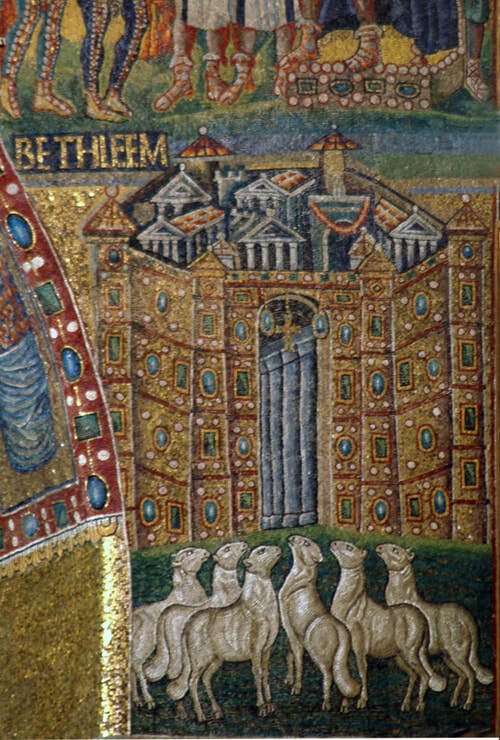 A second, more common analysis among art historians sees the two cities as allegories of the two churches: the Church of the Jews (Jerusalem) and the church of the Gentiles (Bethlehem), drawing upon the text of Galatians 2:7-9.5 Personifications of the churches of the circumscribed and uncircumscribed appear over the main doors of Rome’s early fifth-century Basilica of Sta. Sabina (Fig. 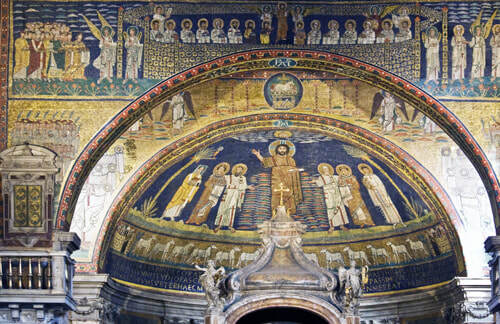 5), while two female figures present crowns to Peter and Paul in the contemporary apse mosaic of Santa Pudenziana (Fig. 6). This motif was especially suited to the city of Rome, with its traditional claim of apostolic foundation by Peter (apostle to the Jews) and Paul (apostle to the Gentiles).6 Thus, the two cities may be representative of these two communities and their leaders’ united mission in Rome (the “concordia apostolorum”). This explanation explains the two groups of lambs and also relates well to the traditio legis motif, as that image similarly emphasizes the importance of Peter and Paul to Rome’s particular claims of catholicity. 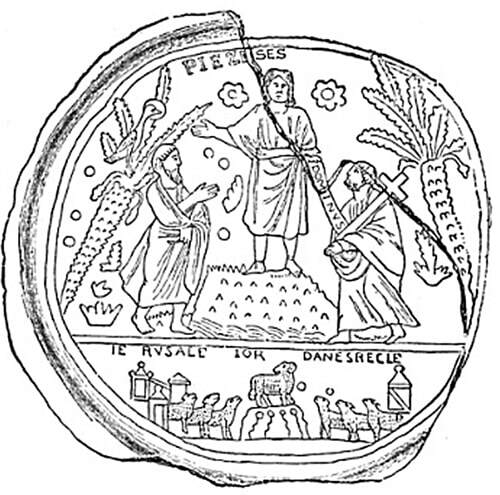 Viewers will notice, however, that in most depictions of the traditio legis—including those with the two cities motif—Peter stands on Christ’s left, while the city of Jerusalem appears on Christ’s right. Paul, likewise, stands adjacent to Jerusalem rather than Bethlehem. However, one may still wonder why this motif was so prominent in Rome. Perhaps Roman Christians believed that this final, glorious union would be consummated in that apostolically founded city. If so, it seems strange that the mosaics do not associate either or both cities with Rome in any obvious way. Nevertheless, the two-covenant argument makes the best sense of the iconography: its right-left structure and most of its components, including the two groups of lambs. I would like, however, to amplify Brenk’s argument by pointing out that in every case but one (the mosaic at Sta. Maria Maggiore), the lambs process out of the city gates and toward the Divine Lamb, who stands upon the rock at the center of the scene. In other words, they are leaving their two cities, not entering them. Thus, these two cities, however much their gemmed walls allude to the heavenly Jerusalem of the Book of Revelation, are origins, not destinations. This crucial detail, together with their consistent relative position (Jerusalem on the left), justifies interpreting the cities as symbolizing the First and Second Covenants, rather than as two Christian communities headed by Peter and Paul. Equally important, the eschatological significance of the mosaics is clearly emphasized in details derived from the Book of Revelation (e.g., the Jordan River and the Four Living Creatures). One of the earliest examples, which is found in the apse of Rome’s early sixth-century basilica of Saints Cosmas and Damian, most clearly expresses this (Fig. 4). Here, Christ appears in a dark blue sky streaked by red and orange clouds, implying that this is the Second Coming. Just below him are Peter and Paul and the two titular saints along with the Roman bishop Felix. A phoenix perches in the palm tree at the left and the Jordan River flows behind them. On the lower margin, twelve lambs form a procession from their symbolic cities toward the Divine Lamb upon the rock at the center. Flowing from this rock are four (here named) rivers: Geon, Pyson, Tigris, Eufrata. Around and above, the framing apsidal arch depicts the Four Living Creatures, the seven lamp stands, four archangels, and the enthroned lamb with a seven-sealed scroll at his feet (cf. Rev 1:12, 5:1). In the spandrels (and now barely visible) are the twenty-four elders garbed in white robes (cf. Rev 4:5, 7:13). The eschatological symbolism appears again and gets even more emphasis in the later apse compositions, such as the one in the Basilica of Sta. Prassede, which includes a depiction of the Heavenly Jerusalem, its gates guarded by angels and its walls enclosing the saints and apostles including the Virgin Mary, St. Prassede, and John the Baptist. Peter and Paul welcome a group of approaching martyrs, bearing their crowns (Fig. 7). In addition to Sta. Maria Maggiore (ca. 435), they are Sta. Sabina (ca. 422), Ss. Cosmas and Damian (ca. 527), S. Lorenzo fuori le mura (560), S. Venanzio (640), Sta. Maria Antiqua (705), Sta. Prassede (ca. 822), Sta. Cecilia (ca. 824), San Marco (827-844), San Clemente (ca. 1100), and Sta. Maria in Trastevere (ca. 1140). It also appears in San Vitale in Ravenna (ca. 540) and Sant’Apollinare in Classe (ca. 545). 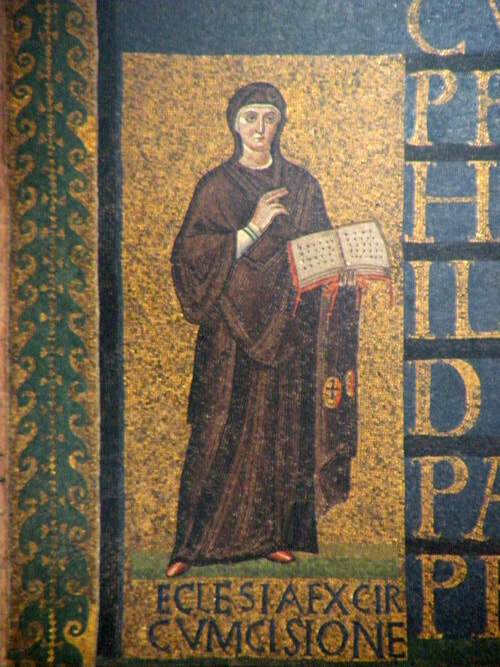 Scholars who have offered a range of possibilities include Beat Brenk, Die frühchristlichen Mosaiken in S. Maria Maggiore zu Rom (Wiesbaden: Steiner, 1975), 46-47; and Walter Nicholas Schumacher, “Eine römische Apsiskomposition,” Rōmische Quartalschrift 54 (1959), 137-202, esp. 170. See Hugo Brandenburg, Ancient Churches of Rome from the Fourth to the Seventh Century (Turnhout: Brepols, 2005), 188; Marguerite van Berchem and Etienne Clouzot, Mosaïques chrétienne du IVe au Xe siècle (Paris: Morancé, 1924), 54-57; and Friedrich Gerke, Spätantike und frühes Christentum (Baden Baden: Holle, 1967), 67-69. The exception to this is in the early twelfth-century mosaic in the apse of Rome’s Basilica of San Clemente, where Bethlehem is on the left. Most recently Erik Thunø, The Apse Mosaic in Early Medieval Rome (Cambridge: Cambridge University Press, 2015), 176; Victor Saxer, Sainte-Marie-Majeure: Une Basilique de Roma dans l’Histoire del la Ville et son Église, Ve-XIIIe s. (Rome: École Française, 2001), 52-53; and Henry Maguire, Earth and Ocean: The Terrestrial World in Early Byzantine Art (University Park: Pennsylvania State University Press, 1987), 12-13. 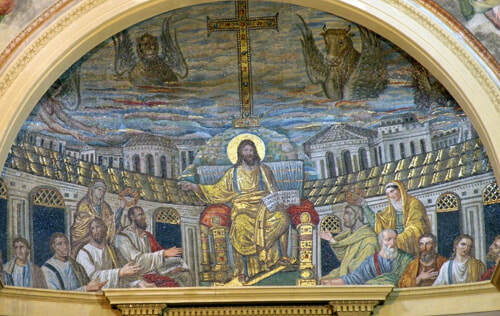 For more discussion of the link of this motif with the traditio legis, the heavenly Jerusalem, and the roles of Peter and Paul as apostles to the two churches, see Fréderick Tristan, Les Premières Images Chrétiennes (Paris: Fayard, 1996), 412-19; Marie-Louise Therel, Les Symboles de l’Ecclesia dans la Création Iconographique de l’Art Chrétien du IIIe au VIe Siècle (Rome: Edizione di St oria e Letteratura, 1973). Walter Lowrie, Art in the Early Church (New York: Harper, 1947), 146. Ss. Cosmas and Damian’s image does not show gemmed walls. Ambrosiaster, Commentary on Romans 11:28.